Let me tell you about my personal experience of the world’s fastest growing sport and hopefully, you to, will feel like having a go. Back in November 2007, I rocked up to the beach having absolutely no knowledge or understanding of what the sport of dragon boating was about. Throughout most of my adult life I’ve participated in some form of sport but never a team sport. I was in the early stages of being 40 plus and was looking for something to do that would get me out of the doldrums of feeling ‘mummies’ and past my best. I have met a great mixed bunch of people from all walks of life, ages and fitness levels. Once you are in that boat it’s no longer just about you, it’s about the team and all pulling together and working together to achieve the best you collectively can. I also learnt that I do have quite a competitive side to my character which, I thought I’d left behind at school. I love competitive racing both here in Dubai and internationally. Each morning when I’m heading to the beach to meet up for a training session, I can think of lots worst places to be than sitting amongst friends with the shorelines of the Palm Jumeriah, Dubai Marina etc to look out. It’s a great way to start the day and you come away feeling energized and ready to face another day in Dubai. Which, let’s face it, isn’t always that easy these days. So, all I can say is have a go, you may become hooked too! 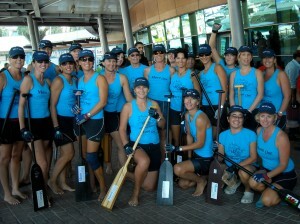 I can only see the positive side to paddling for the benefits of personal fitness, camaraderie and having great fun. For contact details to various Dragon Boating teams, please visit our Sports Directory. The Dubai Dragon Festival Returns!